What is Microsoft Community Tech Days? This is unique program from Microsoft and local user group to enable developers and IT pro to get information about latest technologies from Microsoft. Dive deep into the world of Microsoft technologies at the Community TechDays and get trained on the latest from Microsoft. Build real connections with Microsoft experts and community members, and gain the inspiration and skills needed to maximize your impact on your organization while enhancing your career. What more… you can watch some of these sessions LIVE online from the comfort of your workstation as well. I am speaking at Ahmedabad tech day’s event. Where: Ahmedabad Management Association, AMA Complex, ATIRA, Dr. Vikram Sarabhai Marg. Summary: ODATA is HTTP or web protocol to querying or manipulating data. ODATA uses HTTP, JOSN or ATOM.ODATA can be implemented through any platform supports, HTTP, XML or JSON.ODATA can expose data/information from relational database, File systems, Web sites, services etc. 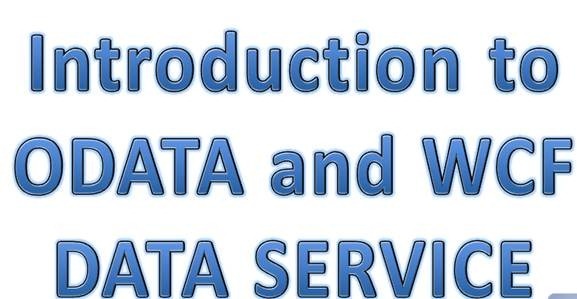 WCF Data Service is a framework to expose CRUD operation as REST service on a data model. 1. How to create WCF Data service on ADO.Net Entity Model. 2. How to create WCF Data service on LINQ to SQL Class. 3. How to consume console application. 4. Paging, URI Options etc. 5. How to consume in Windows 7 Phone application. So, I welcome you in the session.